You've heard of the Andromeda Galaxy and the Orion Nebula, but how about the Orion Galaxy? Probably not. But would you believe the New General Catalog lists 21 galaxies in Orion, and the Index Catalog adds another 9? That's a pretty respectable tally. 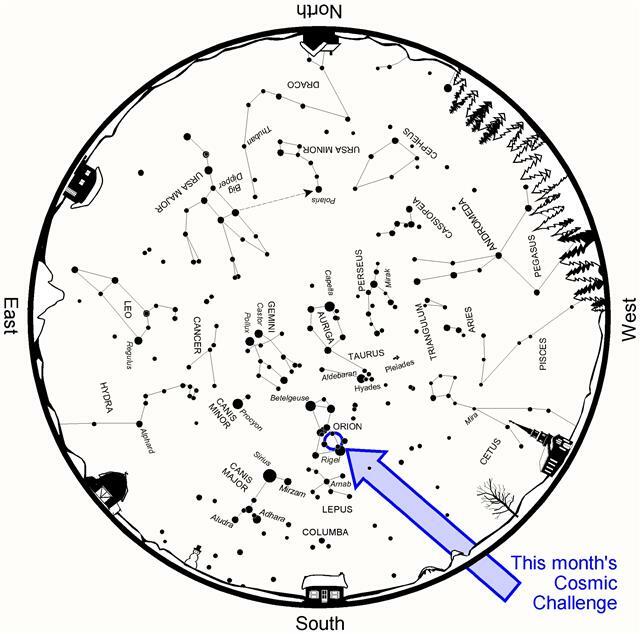 Of those 30 Orion galaxies, I find this month's challenge particularly intriguing because it lies so close to everyone's favorite winter deep-sky object, M42. Yet, I am sure that very few observers have seen it. NGC 1924, a barred spiral galaxy, was discovered in 1785 by William Herschel using his 18.7-inch (47.5cm) reflector, undoubtedly on an evening when he too was admiring the Orion Nebula. And why not? After all, M42 lies less than 2° to the east. That's pretty good company to keep, but at the same time, it can also be a curse, since the Orion Nebula can be pretty distracting. Finding NGC 1924 is easy enough by starting at M42 and scanning due west. Some 1½° into your scan, you will come to a diagonal path of three 8th-and 9th-magnitude field stars oriented northwest-southeast from one another. NGC 1924 lies along the path, like a distant galactic steppingstone equally spaced between two of those Milky Way suns. 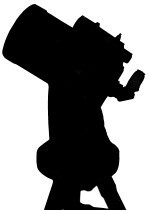 When summarizing its appearance for his New General Catalog, John Dreyer described it as "very faint, pretty large, irregularly round, stars nearby." My 8-inch (20.3cm) Newtonian shows NGC 1924 as a faint, oval disk accented by a stellar nucleus. It lies between two 8th-magnitude stars set amidst a sparkling field of fainter stardust. Larger apertures bring out additional subtle details. Through my 18-inch (45.7cm) reflector, the galaxy reveals a brighter outer edge and a star-like central core, closely mimicking the look of a planetary nebula. Add in the spectacular surroundings and how they add a faux-3D effect, and the beauty of this little treasure really comes through. It's a challenge that you are sure to return to time and again as you further explore its more affluent neighbor. 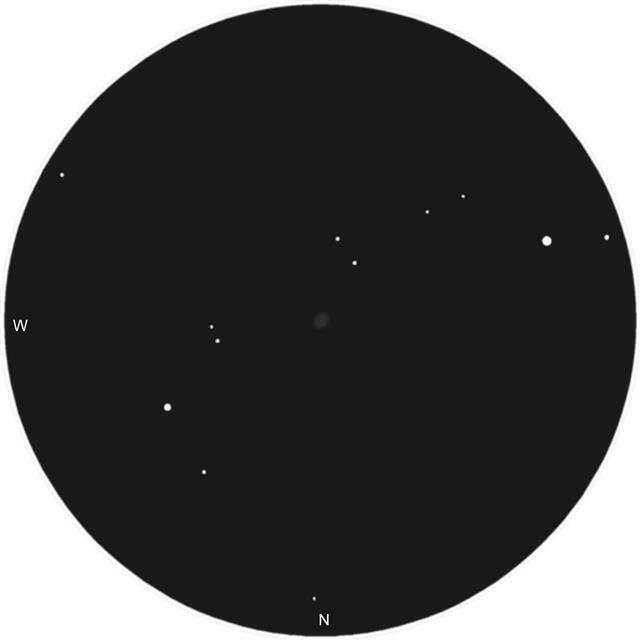 Above: NGC 1924 as sketched through the author's 8-inch (20.3cm) reflector. And what of the remaining NGC and IC galaxies within Orion? Here's the list. 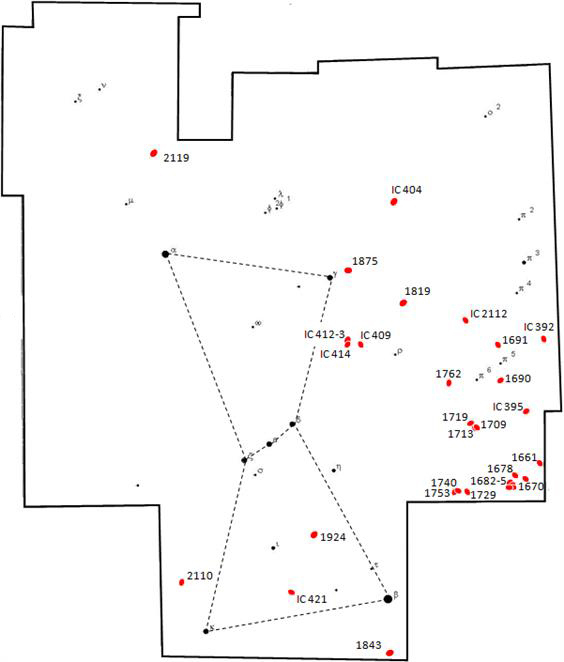 Notice from the chart above how most are clustered along the constellation's west-southwest border. That's not surprising, since that area is farthest from the obscuring dust clouds that permeate Orion. Further west, the river Eridanus overflows its banks with a flood of faint galaxies. Be aware that many of Orion's galaxies are below the cutoff threshold of this column's self-imposed aperture class. But give them a go anyway. I'd especially draw your attention to two galaxy groups. The first is a trio formed by of IC 412, 413, and 414, with a fourth, IC 409, waiting in the wings. You'll find them 3° south-southwest of Bellatrix [Gamma (γ) Orionis]. The second group is a tight pact in the constellation's southwestern corner. NGC 1682, 1683, 1684, and 1685 are so closely spaced that at the chart's scale here, they nearly overlap one another. Notice that the brightest of the four is 12th magnitude, with the others plummeting as low as 15th magnitude. That's a tough test for even the largest amateur telescopes. Be sure to share your results with the rest of us by posting in this article's discussion forum. Thank you, Phil. I never think to scan over that way. Hey, that's a great article Phil. Definitely enough there to get me out on a clear cold night to try and do an Orion galaxy sweep. Just like trading cards when I was a kid...I want to collect 'em all. As always, most of your observing reports are unusual in the sense that they cover many things I've never seen before and I do appreciate that. Thanks! Very cool, Phil! I look forward to exploring those. Thanks! Though I have your book, I've never went for this one. If these lake effect clouds go away when the moon's not up, I'll give it a try with my 7" reflector. NOW I know what I was looking at. I took a single 8 minute exposure of ngc 1924 with my 10" lx200 classic, and you guys have a lot better eyes then I do. What a faint target! You have my respect. Thanks for the heads up an NGC1924. I'd never seen it before. 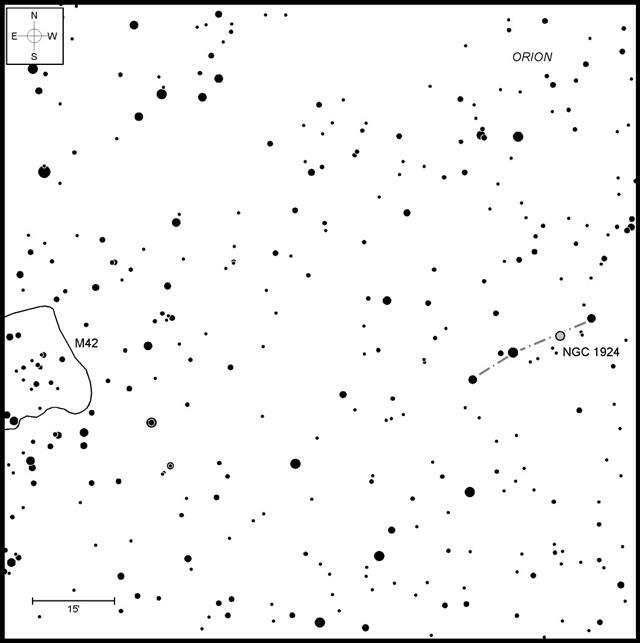 While i was looking at Sky Safari to locate 1924, I noticed a small group of galaxies about 5 degrees at 300 degrees from 1924, PGC 16893, PGC16895 and UGC102. They're listed at magnitude 14.5-14.8. My skies aren't the darkest to the south, there's a prison across the border in Mexico but i was able see them in the 22 inch. Now you've got me interested, I'll be looking for more.. There was a hole in the clouds in upstate NY last night, so I gave the challenge a try with my 8"reflector. I was unsuccessful, but sure enjoyed the effort! I'll keep trying, and when I get another hole in the clouds I may try to filter some of the sky glow to see if that helps.